But the root of their campaign stems from a fear that women are indeed inferior and inadequate. Sadly, many countries and societies have indeed treated women this way. Yet in this week’s Torah portion, Vayakhel, the Torah has a very different view of women. The portion describes the construction of the Mishkan – Tabernacle. This was a communal project, where everyone had to make contributions, and whoever was able to could help in its construction. The Torah provides just a general summary of the donations and the building, and barely highlights any particular donors or builders. There are, however, a few exceptions. In two instances, the women receive a special shout-out for their efforts. One is about the women’s donations of their copper mirrors. People were very committed with their contributions, and even donated their most personal items. But when the women brought their mirrors to Moses, he recoiled in disgust and rejected them. “Mirrors are tools of vanity, which were made for temptation and to inspire lustful thoughts.” G-d disagreed. G-d explained that these mirrors were the dearest of all donations, because the women used these mirrors to make themselves desirable to their husbands, to enhance marital harmony, and to stimulate procreation. The second is about the female wool-spinners. “And every wise hearted woman spun with her hands, and they brought spun material: blue, purple, and crimson wool, and linen. And all the women whose hearts uplifted them with wisdom, spun the goat hair.” The Torah makes a special emphasis on the wisdom of the women – an attribute that isn’t used when describing the men’s role. 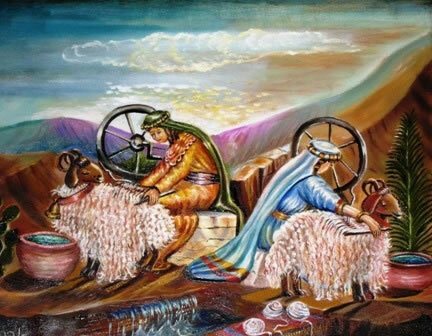 The Talmud explains that the women didn’t simply spin the goat-hair for the Tabernacle, but they made sure to do it in the best possible way. When the wool is still attached to the animal it is of a much higher quality. But it is difficult to spin the wool whilst it is still ‘on the animal’s back’, which is why most spinners shear the animal hair first. But the women were wise, and skilled, and dedicated, and caring, and hard-working. They made sure to spin the wool on the animal’s back so that only the best quality wool would be used for the Tabernacle. These two accounts reflect Judaism’s perception of women that began thousands of years ago. Women are blessed with the ability to bring a qualitative edge to life. Women possess unique sensitivities, wisdom, intuition and grace. Men may be able to achieve more quantitatively, but the special touch is added by the woman. The special touch isn’t just a small detail, but rather something which effects complete transformation. Women can turn something ordinary into something extraordinary; something good into something great; something regular into something radiant; something material into something spiritual. Yesterday women across the world celebrated International Women’s Day. It is truly remarkable that throughout the free world women can celebrate their identities and freedoms. But I hope that women will be able to understand their true cause for celebration. It isn’t just because a particular society freed them, granted them rights and treated them like equals. It is because G-d created them with special characteristics and abilities, and that they are uniquely able to bring change and improvement to the world. Through their depth of understanding, and their capacity for nurturing, and their genuine care and concern, they can lead the way towards a better future for us all.